Coconuts trees stand in unison quietly. One side of their tall, lean trunks are glowing orange as the afternoon sun continues to slow-roast them. I turn back to see the rear angle from the truck we are travelling in (they say some of the best shots you can take are behind you!) to see a massive swarm of dull brown trunks, the other sides. It’s a demonstration of how strong the sun is and how mother nature responds. These trees though aren’t tall compared to the native breeds which are sparsely scattered around the periphery of these massive oil plantations. 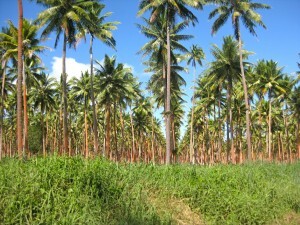 The hybrid palms are used to export their oil and respond to fertilisers only, they are feeble without man-made drugs! 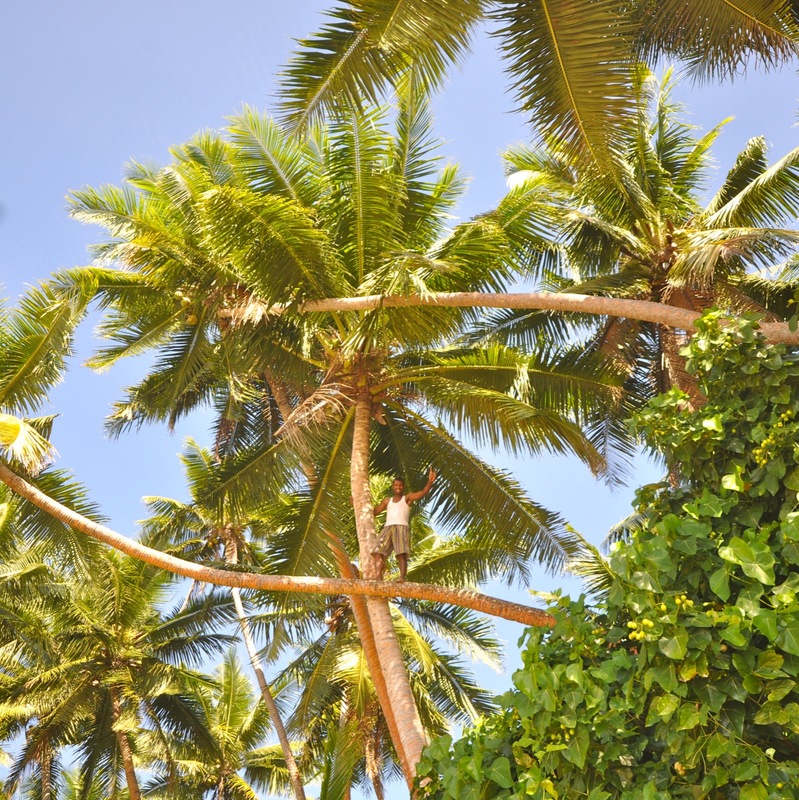 Our truck driver tells us how the hybrids produce miserable tasting coconuts, some fall when they are green – something a majestic indigenous palm would never naturally do. The shorter hybrids are ironically hopeless in cyclones, their leaves fall off and they take ages to recover. They take three years instead of the six years that natural palms take to mature and their fruit baring life is short in comparison to the Fijian palms which produce coconuts all of their sometimes 100-year-long life. Locals are just now realising the benefits of planting indigenous coconut trees. But it has to be said that the hybrids have supplied a constant source of income for the islands, we can’t dispute that. 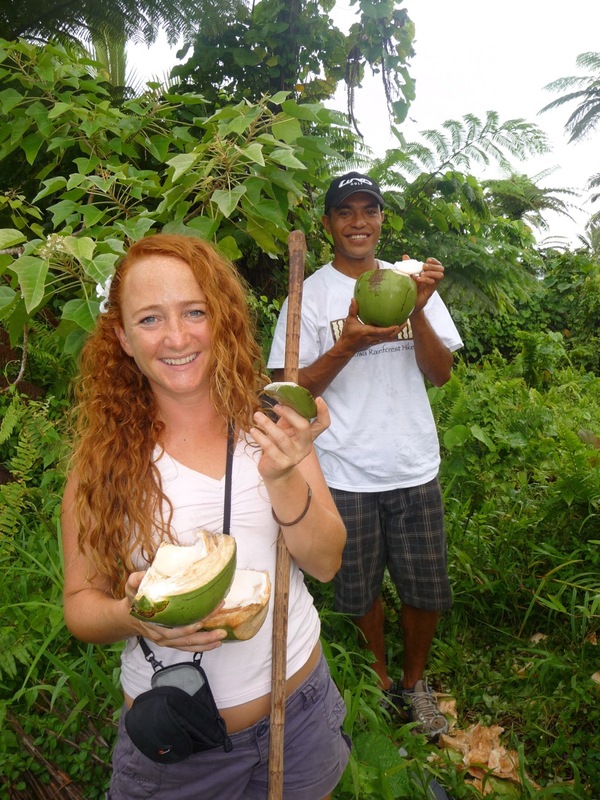 Esava climbing for green coconuts to hydrate us while planting our mangroves.